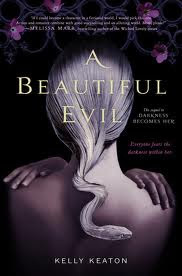 A Beautiful Evil is absolutely amazing! I was glued to it when, I had to put the book down my mind kept drifting back to it again and again. This book is so full of action there is no place that you could put this down and not worry about what's going to happen next. This is a mix in between my two favorite greek mythology series the Chronicles of Nick and the Percy jackson series but, with main character thats a girl. And now I have to wait for the third book, that's the hardest part about reading books waiting for the next.I love this book and I tknow if you like fiction you’ll like this book. "There is power within great sacrifice, within noble deeds. There are moments... brief, shining moments when the impossible becomes possible." Absolutely LOVE the cover, and can't wait to read it! I've been meaning to read the first book in this series, Darkness Becomes Her. Must do so!